Despite my Luddite leanings, this old thing we call the interweb is just too clever! And who doesn’t want a little bit of extra cheese around when all the friends and family get together?? So whether you’re entertaining and want a snazzy cheese plate, or ranting and raving and trying to figure out just what to get that discerning cheese geek in your life, look no further! Whether it’s a Cheesemongers’ Choice selection or a few months of bliss from our Cheese of the Month Club, you and your guests are sure to be sated. Just head to saxelbycheese.com and click the ‘Buy Cheese’ link to check out the cheesy goodness up for grabs. 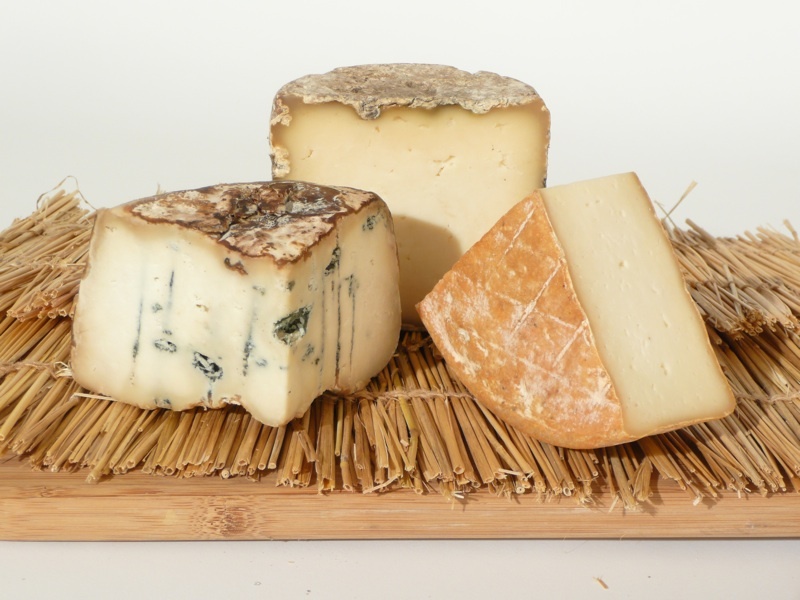 We’ve tailored our selections to focus on the finest seasonal cheese out there, from super small production farms like Lazy Lady Farm in Vermont or Seal Cove Farm in Maine to newly knighted American classics like Cabot Clothbound Cheddar and Grayson from Meadow Creek Dairy. Just leave it to your mongers… we won’t steer you wrong. And for those of you living just around the corner, Saxelby Cheesemongers is offering up a stellar array of cheese platters to ease the craziness of holiday entertaining. Put that old cheese ball recipe back in the closet and have no fear! Just give us a buzz, let us know how many people are descending, and like stealthy dairy ninjas, we will slice and dice together a gorgeous cheese plate, complete with Sullivan Street Bakery breads and delicious dried fruit and nuts. Cheese platters can be delivered, or you can pick up at the shop; it’s as you wish! Like the post office says, nor rain nor hail nor dark of night (and a whole bunch of other stuff too) can keep us from getting your cheese to you! The holidays will be here before we know it! So get ready, get set, and get cheese! Ok, AC/DC would probably never write a song about dairy. But if they did… Dave and Sue Evans’ creme fraiche might be just the thing to inspire them. This week, by some glorious turn of the cosmos, the Evans Farm creme fraiche is in the house. And you, good cheese people, should hurry on over to claim a dollop or two for yourselves! Like a rare Amazonian monkey that eludes all efforts made to study it, this creme fraiche is better known for its disappearing acts than for its presence on the shelves at Saxelby Cheesemongers. To say that the Evans have a lot going on up at the farm would be a bit of an understatement. In addition to husbanding and milking over 90 Jesrsey cows, they make a dizzying array of fresh dairy products including butter, yogurt, milk, cream, buttermilk, and cheese. Sometimes in the grand weekly orchestration that happens up at the farm, the creme fraiche just goes by the wayside. So we’ve learned to cross our fingers, wait patiently, and pounce when the opportunity is ripe! Evans Farm creme fraiche is truly special, and can be used for just about anything you’ve got going on in your kitchen. It is thick beyond belief, so fatty that the top inch or so of every container we open is pretty much pure butter. The bright, golden yellow hue is a nod back to the grass and to the fat, happy cows that produced it. So that brings us to the million dollar question… what should you use your creme fraiche for this week? A better question might be, what can’t be improved by a little dash of the decadent stuff? Creme fraiche makes for a delightful spread; mix it up with herbs and serve it alonside some delicious smoked fish (when was the last time you went to Russ and Daughters??) or atop your breakfast toasties. Plop some atop your favorite creamy soup, or add it to any savory sauce, from tomato-based pasta sauces to rich and rustic pan sauces. Or, if you want to go the dessert route (which according to my mom is always a good route to follow) heap a little bit on your pie, apple crisp, or with some good fresh berries for a simple, but sublime satisfaction of your sweet tooth. And keep your noses to the wind… we’ll be sending out a little whiff about our holiday mail order selection in the weeks to come! Yes, that’s right. It’s our cheese in a box. Sitopia. When I first read that word, it sounded a bit like that futuristic version of humanity alla Wall-E, where people are resigned to traveling about in the permanent comfort of their floating, electrically powered arm chairs. Scary, but not altogether implausible. Thankfully, ’tis not so. The word Sitopia was coined by British author Carolyn Steel in her new book Hungry City, one of the finest tomes (literary anyways) that I’ve consumed in quite some time. Steel looks at food issues from a myriad of different perspectives and comes to the conclusion that what we all need right now is a little bit of sitopia. In her eloquent argument, Steel combines Sitos, the ancient Greek word for ‘food’ with the notion of Utopia, which linguistically means ‘no place’ or ‘good place.’ The idea of Utopia has been bandied about for centuries, millennia even, but as the root of the word itself implies, has never quite taken hold in the real world. In contrast to the unattainable notion of utopia, sitopia is something that we can participate it, and indeed create, through small dealings in our daily lives. Ms. Steel affirms that there are a million ways in which we can fashion our own sitopias, whether we live in the city or in the country, simply by regarding food and our relationship with it (where does it come from? how was it prepared? who did the cooking?) in a more thoughtful way. It seems to me that one of the finest and most fundamental places to channel a bit of sitopia is around the dinner table. We literally sit there, sharing wonderful food and conversation with the people we love, or with people we are getting to know. The dinner table is a little bit like social super glue, keeping us all connected and moored to each other and to our environments. A pretty good place to be, if you ask me. Featuring beverages and accoutrements from a cadre of inspired gastronomic entrepreneurs: condiments from Schoolhouse Kitchen, breads from Hot Bread Kitchen, wines from Uva Wines, and coffee from Crop to Cup. For reservations ($50) send an email to info@saragrady.net with the number of people in your party. Ms. Grady will get back to you with all the pertinent details regarding the location of this clandestine supper club. Space is very limited, so the sooner you email, the bettah!